Teresa Richards went into work preparing breakfasts for hungry commuters and supervising students from Derwen College doing work experience alongside her, with no idea that she was to be the star of the day. 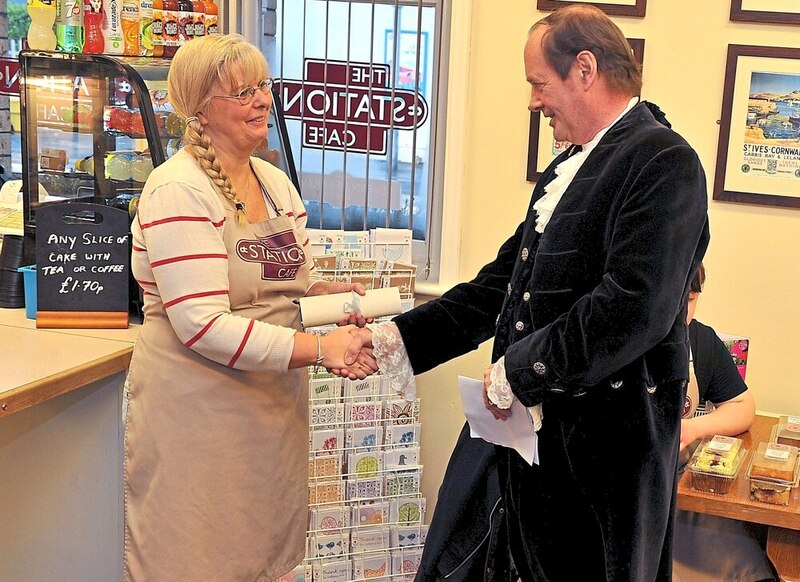 For the Station Cafe at Gobowen Railway Station, near Oswestry, received a surprise visit from a special customer ­— the High Sheriff of Shropshire Rhoderick Swire. He visited the cafe to present the college’s learning support assistant Mrs Richards with The High Sheriff Award, in recognition of her tireless work and continued commitment to the popular cafe. Gobowen Station Cafe is run by Derwen College, a centre for students with learning difficulturies, for the not-for-profit rail agency Severn Dee Travel, providing work experience opportunities to students training in hospitality. Mrs Richards has worked at Derwen College’s Station Cafe, for three years and prior to that was a teacher in the catering department of the college at the main site in Gobowen for 13 years. “It was such a fabulous surprise. I can’t wait to put my certificate up on the wall in the cafe,” she said. “It was so lovely to have everyone – staff, students, customers and community partners – all involved. Derwen College Principal Meryl Green said: “What a difference one person can make. Teresa forms great relationships with the students and this provides an excellent base for learning. “Under her guidance the students are learning work-ready and independence skills through making and serving drinks, snacks and lunches, dealing with payments and developing people skills. These skills are essential in order to prepare students for future employment.